Elon Musk and his teams across his companies are truly changing the way of future transportation and the progress is not slow at all. 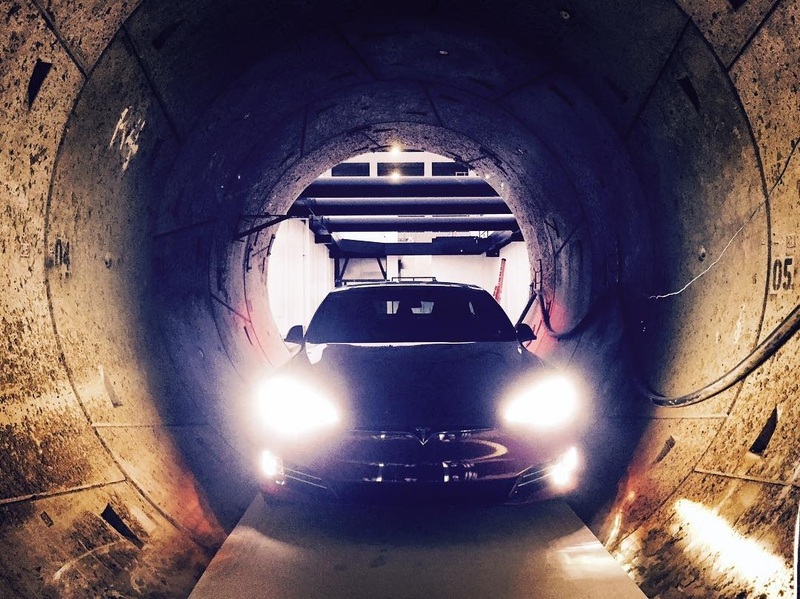 Last month Elon Musk released a short video of a Model S being lifted down in the tunnel and now we got another teaser photo (below) from him of a Model S standing inside the tunnel. Until now the Boring Company had been digging a test tunnel only under the SpaceX property but recently got approval to dig a two mile tunnel in Hawthorne, California as reported by Daily Breeze. “You don’t see it, don’t hear it, and certainly don’t feel it,” said Brett Horton, SpaceX’s senior director of facilities and construction, who also oversees Boring Co. work. Elon Musk also announced last month that several state and city governments were interested in the tunneling projects and had even given ‘verbal approvals’. So this two mile Hawthorne test tunnel will decide the future of the Boring Company projects as media and govt. officials will be keeping a close eye on the success or failure of this small scale venture. Other related development on the SpaceX campus has been the Hyperloop racing competition between teams from different countries trying to gain as much top-speed as possible inside a near vacuum test tube using their custom designed hyperloop pods. Yesterday the competition is won by the WARR Hyperloop team from University of Munich, Germany who were able to gain top speed of 202 mph (325 km/h). Elon Musk was present at the event and appreciated young students for achieving such a milestone and breaking the previous record set by Hyperloop One of 190 mph (305 km/h). 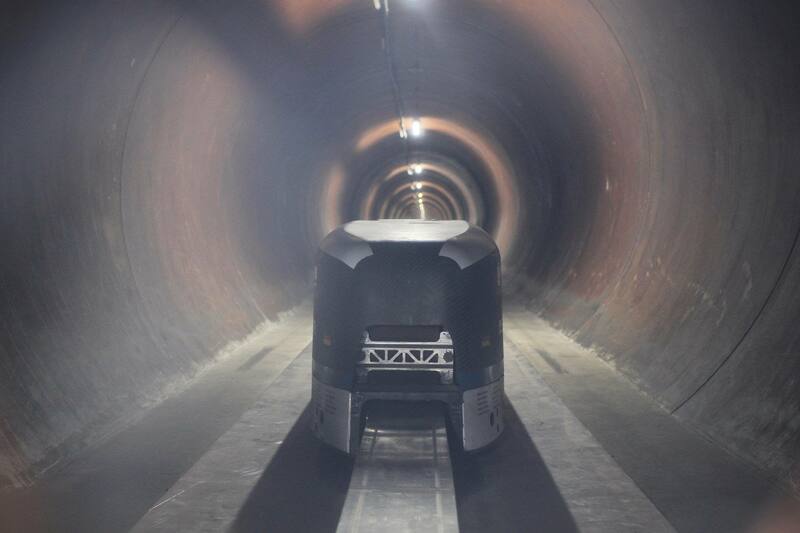 In the below photo we can see the WARR Hyperloop’s pod inside the 1.7 km long near vacuum hyperloop test tube located within the SpaceX boundary. Elon Musk also released a video yesterday showing the WARR Hyperloop pod reaching it’s max-speed inside the tunnel and braking almost instantly as the design team claims the pod would come to a full-stop in just 5 seconds. Warning: Motion Sickness Alert ! WARR Hyperloop team have assembled a nice web page detailing their pod’s design and architecture. Elon Musk also gave a brief speech after the racing event emphasizing that this type of inspirational stuff should always keep happening in order to move forward and solve real-world problems. He also mentioned that future hyperloop competitions will see greater top-speeds such as 370 mph (595 km/h) or even more, so that would be interesting to watch. The Boring Company’s tunnels and Hyperloop have become a single project since Elon Musk plans to convert the tunnels to ‘near vacuum hyperloop capable’ that will move vehicles on an electric sled fast enough to cover the distance between New York and Washington D.C in just 29 minutes. So by connecting the dots we can see that SpaceX, Tesla, Boring Company and Hyperloops are all part of a single puzzle masterfully designed by none other than the great Elon Musk, it’s even beyond the Tesla Master Plan and keeps growing. Let us know your useful thoughts in the comment section below. Follow us on Twitter / Facebook / Flipboard to stay tuned. Increased locomotive power and a rarefied, but survivable atmosphere is not possible? What if the pressurized cabin should fail? Airline style oxygen masks?